Hi everyone. I apologize if I am writing about the same issue, but I haven't found specifics to help my situation. I just realized recently that my second zone upstairs is not heating up, but working on the first floor (zone 1). 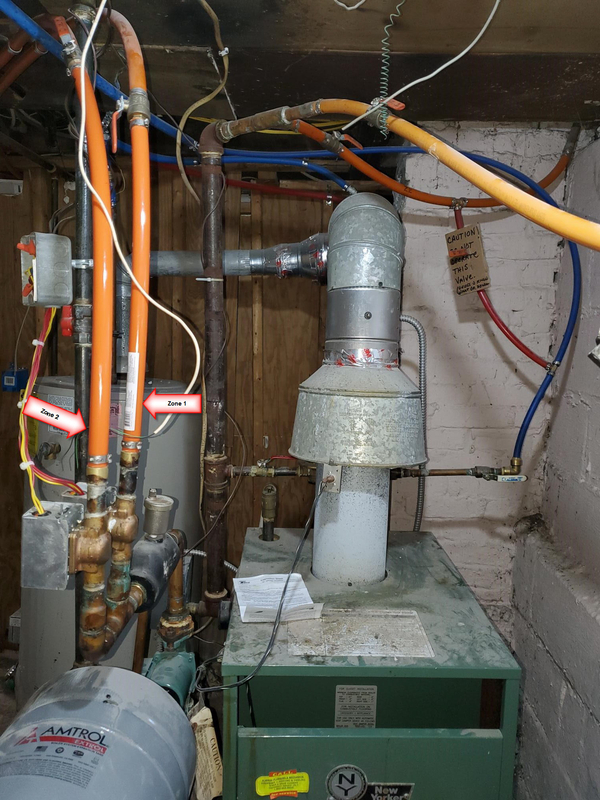 The furnace is in the basement, and since it is heating zone 1, can it be the circulator? I also noticed that the PSI was slightly above 0 (on cold with all thermostats off), so I added more water into the system until the PSI read 15 to 18. I have water baseboard heating and I can hear some water sounds on the second floor, but struggling, if that makes any sense. What I haven't done and was thinking about is releasing all the water from the furnace and filling it back up. Is that a safe idea? Please, any help is appreciated! * I am so sorry, this was posted in the oil heating category. This is a natural gas furnace/heater. Zone valves or circulators for each zone? You may simply have an air problem and a proper purge is needed. You may have a control problem, either zone valve, circulator, aquastat, or and actual component problem. 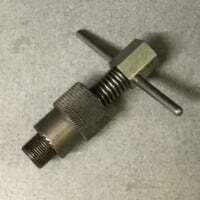 Easiest/fastest and overall cheapest is to have someone experienced in hydronics come out and troubleshoot, as anyone here would just be guessing. I have zone valves. What do you mean when you say proper purge? is that completely draining the system and re-adding water? I am adding a picture, I hope this gives a better visual. Do you have air bleeders on the radiators on the 2nd floor? Well for starters, that's pretty ugly and sad near boiler piping. Is all the flex pipe new? Does it have an oxygen barrier, specifically the red and blue tubes? If it doesn't you are heading for disaster-specifically oxygen corrosion that will make a mess of things. If it does, you won't need to drain the system, just purge it of all air, one zone at a time. The air scoop and air vent between the zone valves and the circulator are pretty worthless. I also don't see any easy way to purge air at the boiler. Hopefully you have a way to bleed air as @JUGHNE mentioned. @STEVEusaPA hahaha, yeah I thought it was a little sad looking, but I purchased the house that way. It was a foreclosure that a buddy purchased and had fix up for me. A lot of the pipes were missing when he purchased the house, I was on a budget so the boiler was salvaged as is. And I am not sure what is an oxygen barrier, but there is a cut off valve on the piping that connects the blue and red pipes. @JUGHNE I honestly don't know if there are bleeder valves on the radiators, it's baseboard, will that have it also? I will check tonight. I am just reading and teaching myself as I go. As you can see I am on a budget and was hoping this would be something easy to fix. You need to look at the ends of the baseboard heaters. There are end caps that will usually slip off, if one has a hinged cover that may be where the bleeder is. Show pictures of the ends. Your basement piping does not look to allow for easy air purging of each zone. These BB bleeders may get you heat up there. If there are bleeders there, do I just twist them with the heat turned on? Do I do it individually for each? and how do I know it's done bleeding? will water come out or just the hissing just stop? Sorry for all the questions. First locate them all. Then usually a good sized flat blade screwdriver will unscrew them....go only 1/2 turn at first. They are brass and you want a good fit for the screwdriver or you may bugger them up. If you have the 12-15 PSI in the system you may get air coming out and then water. You have to maintain the PSI to get the air pushed out....usually the auto fill valve will give you that if it is working. You may have to do this several times. Then fire up and see what happens. If your pressure goes beyond 20 your air tank may be at fault. Air in the system may have been compensating for a failed tank. Chances are your PRV water feeder is not working. You lost pressure on the system so you had enough pressure for the first floor but not the second floor. get the pressure to 15 psi and bleed the second floor and itshould heat. I am sorry I did not get a chance to try your suggestions last evening. I will get to it this weekend, luckily the weather has been warm and the heat is not needed. One a side note, would anyone be able to tell me if the water feeder nozzle, needs to be off at all times? except while adding water into the boiler of course. Or is it safe to just leave it open? It has always been left off, but it was just a thought I had. Thank you all again. You need a working pressure gauge to be sure the pressure regulator works. Yours was off for perhaps a reason. It might have been overfilling and popping the relief valve. Leave it on while you are bleeding air and you can observe the gauge. In theory, with no leaks in the system, you can leave it off. There is more to this, but for now leave off. The book "Pumping Away" by Dan Holohan might give you some good basic info. That's some down right funky piping right there. The valve that's off with the cardboard was a poor afterthought when they realized they couldn't purge it either and cut in a bypass. 1- Turn off the boiler. 1- Close the ball valve to the auto feed. 2- Close the 2 ball valves on the supplies. Connect a hose to the drain valve below the circulator. Buckets will do but a drain is better. 3- Manually open one zone valve. 4- Open the drain valve. 5- Gradually open the bypass (cardboard) valve. Its purging with street or well water pressure so regulate the bypass valve so the water doesn't rocket through the pipes. Once the air is out close the bypass valve then the drain valve. *** You must close the bypass valve first***. 6- Manually close the zone valve. 7- Repeat for the second zone. When done, make sure the bypass valve is closed. It might be a good idea to take the handle off and zip tie it to the pipe. Open the valve to the auto feed. Open the two ball valves on the supplies. Make sure the boiler pressure reads 12-15 psi. If the pressure is too high, drain some water. It's not piped to be able to purge through the boiler but it's all you've got. Replacing that monstrosity should be the first thing on your list. That is the other option. I would almost be leery of moving any valves down there. But IIWM I would try the bleeders (if any) first. It may get you thru the rest of the heating season. I turned on the heat this AM just to check and nothing, no noise through any of the pipes upstairs. In the past I would actually hear water sloshing through the pipes but not this time. My final saving grace is to try and purge the pipes I guess. I will follow @HVACNUT instructions and see what I can produce. Fingers crossed!!! BTW, can anyone identify which is the return from just looking at that picture I posted? The return has the zone valves. First off. Thank you, thank you! to everyone that has chimed in and/or looked at this post. I was able to get the 2nd zone working, by following instructions and improvising a thought of my own. I was able to purge the 2nd floor and removed all the black water that came out of it and kept running it until the water was flowing clear. This was my second attempted purge and because of the comments, youtube videos and instructions I was able to understand how this all works. I wasn't fully clear until @HVACNUT pointed out the return pipes, coupled with his directions, then it all came together. I will post my steps after this in case anyone ever stumbles upon this issue!!! I am happier than a camel on Wednesday right now! THANK YOU!!!! 9. Turned on the boiler switch and set the thermostat to call for heat, and VIOLA!! On a side note, what I did notice was the air relief valve above the circulator, next to the return pipes was tightened, so I loosened it. I have this forum and it's members to thank. 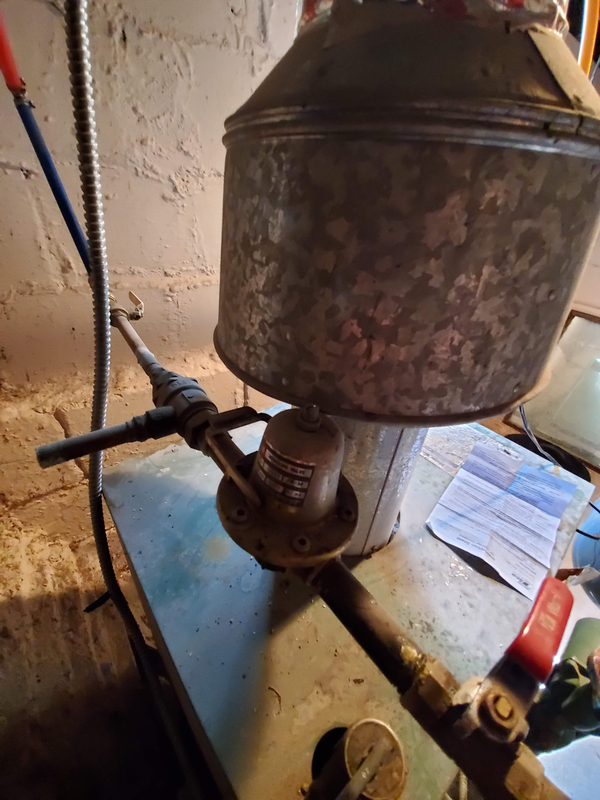 I believe that bell-like contraption before the feeder valve is a pressure relief valve, but does that hood above it prevent it from functioning properly? Also, is it safe to leave that feeder valve on or should I just leave it off? I've read a lot of mixed comments, some say it's not recommended and others say it's what keeps water in your boiler in case it runs low. What you have pictured above between the yellow handle ball valve and the red handle valve is a backflow preventer and the thing that is shaped like a bell is a pressure reducing valve. That valve is made to keep the boiler pressure at a set point of 12psi. It makes sure that your boiler is filled with water at the 12psi set point, and not city/or well water pressures that are higher. You need to keep the red handle pictured opened. The pictures shows that you have it closed. Open that valve.